Hello there! Feels like I’ve been away for ages, but we were only away for a week! I’d like to say we had a restful holiday, but truthfully we were all ill and it wasn’t quite what we’d imagined. Everyone’s largely recovered and I’ve got a course of antibiotics, so will hopefully be on the mend soon too. But enough of my ‘woe is me’ story, how about seeing some sewing?! One of my stitchy friends – who actually lives nearby! – had signed up with me to join the Colour Intensive course with Stitched in Colour and we’ve been discussing it on the school run when we bump into each other. Anyway, it was her birthday last week and inspired by one of our lessons on rainbows I decided to raid my scrap bin with an idea of creating a colourwheel. 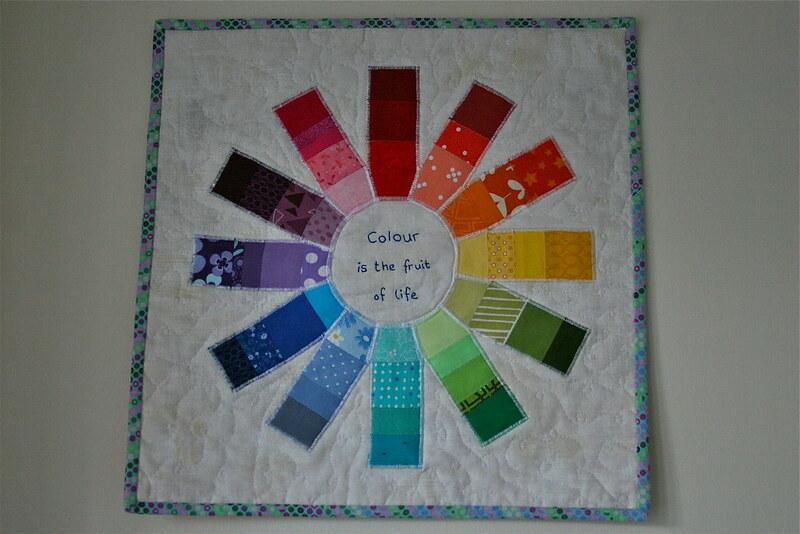 Restricted by the widths of my scraps I ended up making colour spokes with tapered ends to create the wheel. 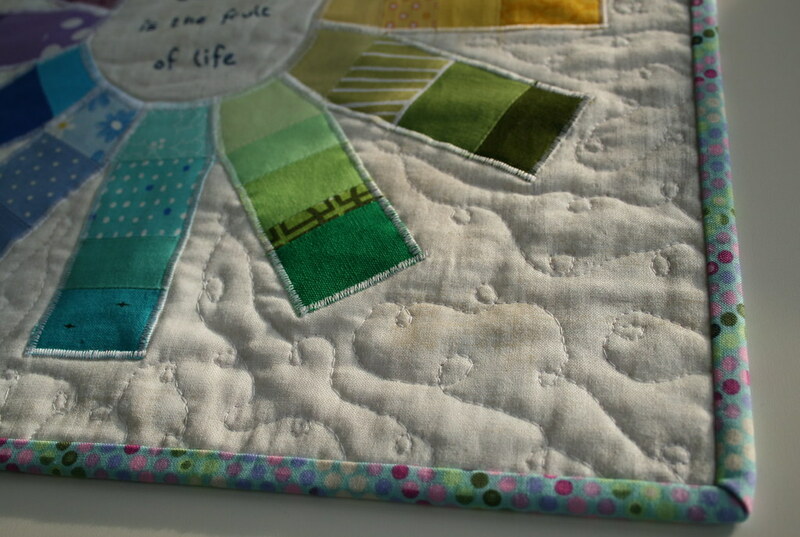 I used Elmers glue to stick each end of the spokes in place before appliqueing them in place with Aurifil. 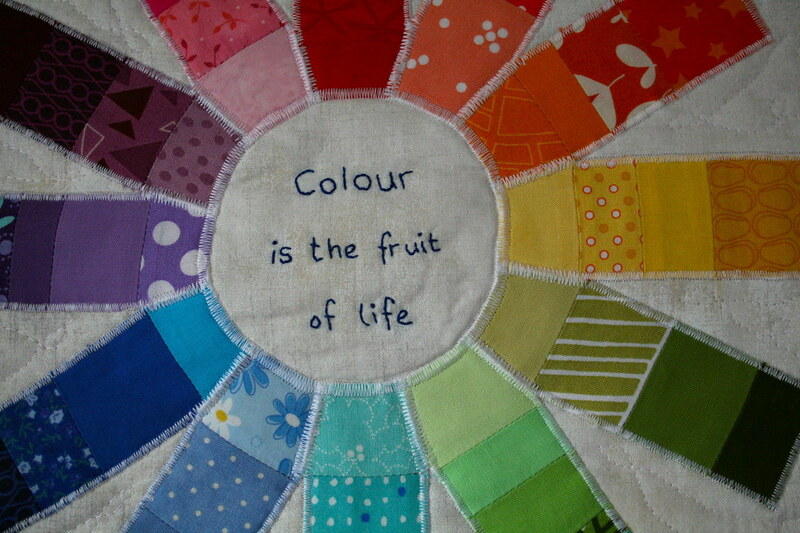 The middle seemed a little bare so I looked around for some quotes on colour and found this one by Guillaume Appolinaire which seemed quite apt. I lightly free-motion quilted loopdy loops around the spokes before using a bit of Tula Pink microdots for the binding: I tell you, dots on the bias make an awesome binding!!!!!!! It’s a small wall-hanging at just 15″ square. Being the first one that I’ve ever made I spent a little while unsure of how to finish on the back for hanging, so I thought I’d show you what I did. A google search came up with lots of solutions and in the end I settled on using two 3″ squares folded diagonally and attaching them to the top corners prior to attaching and finishing the binding. A bit of dowling and it was good to go! I dropped it off to my friends tonight and she seemed to love it. Now I might just need to make one for myself!!!! Wrap Bracelet – Ta-dah & a tutorial! Gosh, this is lovely, and also very practical. It's so useful to be able to see how colours go together. This would look great hanging in a sewing room. Great use of scraps, bet it hardly made a dent in them though!